Chalk Paint™ – What is Chalk Paint™? - Who is Annie Sloan? - Chalk Paint™ – What is Chalk Paint™? This is a warm blue without any green in it. 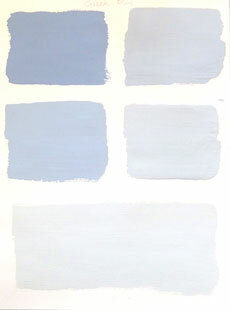 It is a colour found throughout the Mediterranean, often faded and distressed on shutters and woodwork. It has a chalky look about it yet it is a strong positive colour. Click the buttons below to start your online shopping for all of the Annie Sloan products you're looking for. 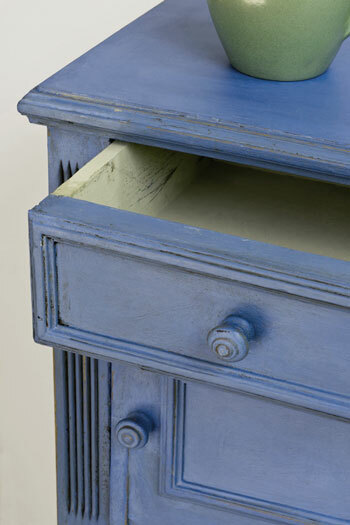 A French bedside table painted in Greek Blue with a little dark wax in places rubbed ibn to reveal the texture, with Versailles inside the drawer. For a cool,sophisticated and subtle paint Greek Blue first then a layer of Château Grey before waxing and rubbing back with sandpaper. * Between 150 Victoria St. & 100 Park St along the fences on the east and west end of the alley. * On Theresa St - one way street off of Jubilee Drive that leads directly to ArtHaus150. You can conveniently purchase Chalk Paint™ decorative Paint by Annie Sloan and all of the other Annie Sloan products through kathiejordandesign.com. Click Here!